DANCING WITH THE STARS lost the beat. ABC: DANCING WITH THE STARS had the lowest cycle premiere rating in its history at 2.1, down 0.6 from the midseason 2014 premiere, and down 0.4 from last fall’s start. CASTLE slipped 0.1 to 1.5. NBC: THE VOICE fell half a point to 3.3. THE NIGHT SHIFT is currently up 0.2 to 1.5, although if it started at 10:01PM, that could change in adjusted numbers. CW; THE ORIGINALS gained 0.1 to 0.6, and JANE THE VIRGIN lost 0.1 to 0.4. 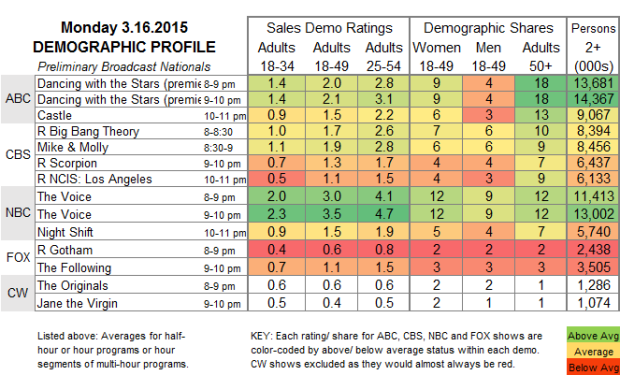 FOX: After 0.6 for a rerun GOTHAM, THE FOLLOWING was steady at 1.1. 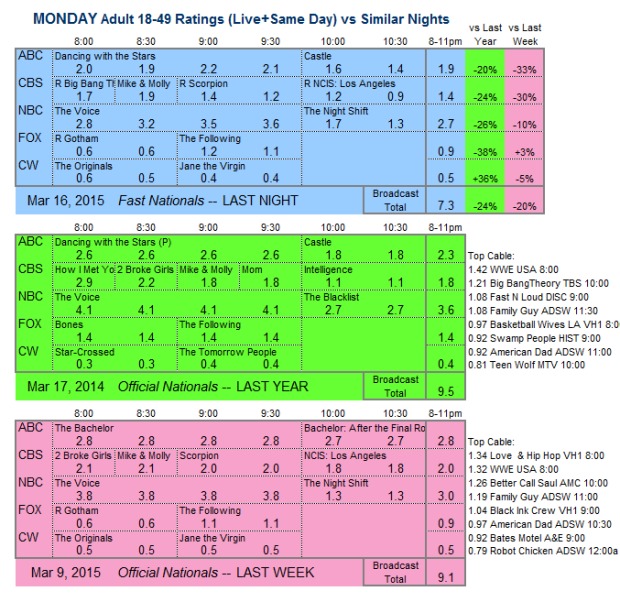 CBS: The only new show of the night was MIKE & MOLLY, down 0.2 to 1.9. Not surprisingly, the reruns were led by THE BIG BANG THEORY at 1.7. It’s a busy midseason night tonight. as NBC unveils its 9PM comedy hour of UNDATEABLE and the new ONE BIG HAPPY, and CW unburies IZOMBIE after the return of THE FLASH. CBS is in reruns, and only AGENTS OF SHIELD is new on ABC.